The recent NNW winds appear to have knocked a few north bound migrants from the sky. A quick turn around Lake Junaluska last Saturday (Mar. 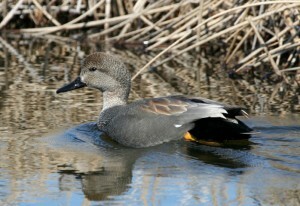 3) revealed 10 species of ducks. That’s not counting any of the mallard/mallard-hybrids. I sometimes encounter what I believe to be wild mallards at the lake, but not many and not often. Mallards that I see that are wary and flush when I get within shotgun range, or mallards I see in a mixed raft of migrants, I consider wild. But when you’re glassing the lake there’s no way to tell if the mallards you see from a distance are wild or feral so I defer to the more conservative approach and consider them all feral. Ducks were encountered all around the lake. The recent rains have once again hampered efforts to drain the lake leaving standing water in pools here and there. The most water is, of course, near the dam extending back for a few hundred yards. There was one pretty large raft of waterfowl in this area. This raft comprised at least 10 species of ducks. I recorded five species of dabblers and five species of diving ducks. It was hard to get really good looks at individual birds, even with a spotting scope because of the buffeting winds. The dabblers I saw included one drake wood duck, one drake northern shoveler, a mixed group of gadwall, wigeons and a few green-winged teal. The diving ducks included lesser scaup, ring-necked ducks, buffleheads, redheads and ruddy ducks. Ruddy ducks and buffleheads were also seen at other points around the lake. I also saw a group of 20 ring-billed gulls resting on a mud flat at the water’s edge. There were also good numbers of killdeer foraging on the mudflats, both in front of the swimming pool and along Highway 19. Stan Wukowicz and Connie Ward recently reported finding a Wilson’s snipe mixed in with the killdeer. Migrant shorebirds like pectoral sandpipers and any or all of the peeps (least – semipalmated – western sandpipers) will likely join the killdeer within a couple of weeks. Other shorebirds that have been recorded at Junaluska when water levels were low include greater and lesser yellowlegs, short-billed and long-billed dowitchers, plus black-bellied, American golden and semipalmated plover. Other waterfowl or water birds that I saw Saturday included pied-billed grebe, American coot and three double-crested cormorants. The cormorants looked out of place standing on the shore next to one of the buckets used to feed the hordes of geese and ducks at the lake. I don’t think these fish eaters were poaching corn – probably just liked the company of the geese, swans etc. I also saw my first tree swallows of the year Saturday at the lake. Bob Olthoff said he had seen tree swallows there on March 1. Bob also said a mature bald eagle was checking out the coot buffet last Friday. By the time you are reading this, this particular raft of ducks may well be winging it father north. But fronts from the north during the next month or so will likely stall other waterfowl while a southerly flow could bring shorebirds cruising through.